I have a physical disability and use a powered wheelchair for mobility. While studying at university, I experienced several issues with regard to wheelchair access to the various facilities on campus. I worked with the university’s disability officers to successfully and speedily resolve many of these issues before they became problematic. However, one major building refurbishment on campus which presented ideal opportunities to correct long standing impediments to access for people with disabilities was particularly challenging. The university’s on-campus cinema had an appalling and unsafe standard of wheelchair access into and within the cinema. This included a very narrow access way with a steep drop-off to be negotiated to the ‘wheelchair access’ seating. On hearing of the proposed refurbishment, I was excited and eager to ensure that the cinema would finally obtain first rate wheelchair access. I wrote to the project team requesting details on wheelchair access provisions, with the response assuring me that “Access for people with disabilities is very important and will be properly considered in the design…” At that stage, warning bells and flashing red lights filled my mind having previously experienced how such vague statements usually fail to deliver. So I shot back a letter requesting a meeting with the architects and project team. After some deliberations, a disability access expert and I trundled in to meet them. Encouraging people to choose tap water over bottled water has taken on a new edge with Yara Valley Water launching its new Be Smart Choose Tap App. Research has shown that people often drink bottled water because they do not have access to tap water. The Choose Tap app will help them find the nearest Water Refill Station and Drinking Fountain. This will reduce the amount of plastic ending up in landfill and our waterways as more than half of all plastic bottles purchased are discarded without any thought as to the damage they do to the environment. To date, Yarra Valley Water has added all the water refill stations within their municipalities, including those in recreation areas under the Choose Tap program. It is also encouraging other councils to submit their water refill stations locations and asking the community to help map the water refill stations and drinking fountains that are not on the app. The Nine Network pulled Greenpeace’s recycling ad from its Friday night football coverage. The ad has people drinking soft drinks on a beach as birds start falling from the sky and washing up dead, the reason – plastic waste. The half-minute ad slot cost Greenpeace $22,000 and was due to be shown during Friday night’s NRL match featuring the West Tigers and Cronulla Sharks. According to Channel Nine, the ad was dropped as its content was ‘offensive’. In 2008 Manly Council installed 6 filtered Water Bubblers costing the Council a whopping $55,800 to purchase and install ($9,300 per unit). Each of these units consisted of a separate bottle filler and bubbler. In an effort to reduce the costs, Manly Council looked for options and together with Arrow Alpha came up with a design that incorporated the filler and bubbler into one unit resulting in the first aquafil water bottle refill station and bubbler. By the end of 2010, 12 aquafil units had been installed in Manly and since then the aquafil product range has grown and now boasts a comprehensive range of refill stations and bubblers. Reducing the amount of plastic bottled water used in the community goes a long way in the fight to reduce plastic waste and save our precious resources, and lets not forget the savings associated with not having to purchase bottled water! All the units are vandal resistant, easy to keep clean and wheelchair accessible ensuring everyone is able to fill up or have a drink. A progressive public drinking water refill package from Australian company Arrow Alpha has been chosen by Sydney’s Leichhardt Council as part of its initiative to refurbish an important retail/cafe strip of this esteemed inner city sector of Sydney. Council’s 2009/10 Main Street Improvement programme under current Mayor, Mr Jamie Parker, sees Arrow Alpha providing its‘ aquafil’ water refill station. While Arrow Alpha is fast gaining recognition as a strong force in encouraging community water refill stations, this specific aquafil unit also shows how versatile the system can be as an aesthetic showpiece to display and reinforce the cultural history of an area. Located on the corner of Marion and Edith Streets, this aquafil refill station has a striking facade featuring an intricate mosaic. It acts not only as a stylised site-marker but also a showpiece community item to visually link its locale to the Italian culture that put Leichhardt firmly on the international tourist map; much like the suburb of Carlton achieves in Melbourne. Arrow Alpha says this aspect of its refill stations is taking on a new level of importance because councils, school bodies as well as private companies and business parks can utilise aquafil’s panels for branding, marketing and decorative purposes. Arrow Alpha is also a supplier of Australian-Standard-approved bike racks that meet modern day demand of Australian residents demand for carbon footprint reduction. With a firm push by councillors in many areas of Sydney – particularly in central zones – to increase and integrate bicycle tracks for cleaner travel and better general health of the population, the concept of the water refill station is gaining momentum as a solution to not just provide convenient stops for drinking water but to also reduce the level of empty bottles being discarded into waste streams and on the streets. Arrow Alpha’s water refill station in Leichhardt has been installed as part of a greater works project that includes bike racks, decorative lighting, more spacious and updated paving and tree preservation orders. Another aquafil water refill station is being introduced in the nearby Annandale Shopping village. Able to be tailored for the end user, aquafil is a sustainable amenity that alleviates poor hygiene problems that plagued traditional water fountains in decades past. aquafil water fountain’s bottle refill points have anti-bacterial nozzles. Wheelchair accessibility is a standard, signage facilities prominent; they have optional sub–floor drainage, and the choice of filtered water configuration if desired. Bottle refill points are nominally positioned on the sides of these units – made of silver impregnated plastic and stainless steel to eliminate any threat of bacteria. Germ potential was one of the main reasons that traditional drinking fountains disappeared from the public landscape. aquafil units also combat another primary reason why drinking fountains have had a long absence from parks and streets – vandalism. Anti-vandal nozzles and buttons are a feature of the product line. Because the units comprise highly visual modular panels, it ensures space for colourful branding or promotional activity and this is well received by councils, transport authorities, shopping centre management and general businesses which can utilise this aspect of design to publicise messages on a 24/7 basis. Arrow Alpha Industries has designed the aquafil drinking fountain and water refill unit to be maintained very easily by using off-the-shelf components. 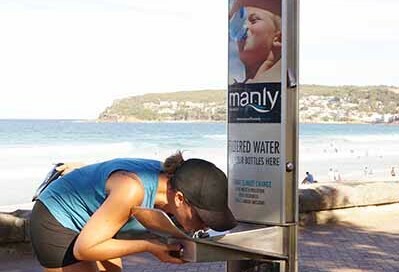 Manly Council was the first council in Australia to provide filtered water refill stations to the general public for drinking and refilling bottles. Their aim was to combat climate change and decrease their impact on the environment by reducing the consumption of bottled water and its associated plastic water bottle waste in their community. To achieve this, Manly Council set out to encourage its residents and visitors to reuse and refill their water bottles instead of discarding them and purchasing new ones. 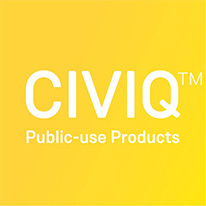 The Filtered Water Refill Stations were a practical and deliverable solution that the council could easily implement. With an existing network of water supply pipes and drinking fountains, incorporating the Filtered Water Refill Stations was a simple way the Council could demonstrate their commitment to helping the environment. Research done by Manly Council found that 75% of containers in the waste stream were water bottles. Not only is their waste an issue, according to the Department of Environment and Climate Change, each litre bottle of water takes 200mL of oil to produce, package, transport and refrigerate. As a result, at least 50 million litres of oil is used in the manufacture and distribution of bottled water in Australia every year. Since the implementation of 6 Filtered Water Refill Stations, Manly Council have estimated that they have prevented 150,000 litres of water from being purchased. This equates to approximately 250,000 plastic water bottles they have stopped entering the waste stream. Due to the success of this initiative, the Council has implemented an ongoing program to provide more Filtered Water Refill Stations in their local area. It also encourages other Councils, Governments and communities to implement the same initiative for a better future.